Full STEAM (or is it STEM) Ahead! There are so many different learning styles. Some children learn best by reading things. Some learn best by seeing things. Some by doing things. Sometimes a combination of these. And then there are those of us who learn best from music. I’m a member of that last group. I like to think of those in my age group as The School House Rock generation. We are those kids who spent Saturday mornings learning about science, math, grammar and more – all set to music that was so catchy, we can still sing all the words to “I’m Just a Bill” and “Conjunction Junction.” Over the years, I’ve often thought if all of my school subjects had been set to music, they would still be in my brain alongside the lyrics to every song from my teen years. And that’s where the three albums below come in. As we all know, there is a great emphasis on STEM education in our schools. But sometimes, if you don’t have the most analytical brain or that much of an interest in these subject areas, it’s hard to remember all of the concepts. And that is the beauty of these albums. Each album takes a different approach to STEM subjects and each employs different musical styles, but they all set the STEM concepts to music in a manner that will have kids learning without even realizing it. 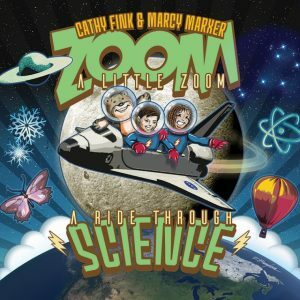 First up, the duo of Cathy Fink and Marcy Marxer mark their 35th album collaboration with Zoom a Little Zoom! A Ride Through Science. In this collection Fink and Marxer create contemporary arrangements of 10 songs that were written by Hy Zaret, composed by Lou Singer and released in 1961 as part of the educational collection, Ballads for the Age of Science. With this modern update songs that cover topics such as what makes lightning, the constellations, what makes an insect an insect and gravity are allowed to shine in a way that will appeal to today’s young listeners. 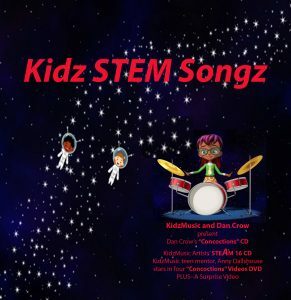 Kidz STEM Songz is more than just a compilation of songs, it is two full albums and a DVD of music videos. Collected and compiled by children’s music artist Dan Crow and his partners at KidzMusic Records, the first CD in this box set is Crow’s 2016 album of STEM focused songs, Concoctions. The five songs on this album cover simple math concepts, technology and the fact that science is all around us. The album also includes five karoake tracks of these songs to encourage kids to sing along. The second album in this set is KidzMusic’s STEAM. The 15 songs on this album cover topics from the genius of Einstein to botany. Each track is performed by a varied group of children’s artist ranging from Lucky Diaz and the Family Jam Band to Jonathan Sprout to Eric Ode and Danny Weinkauf. This box set is definitely a one of a kind. 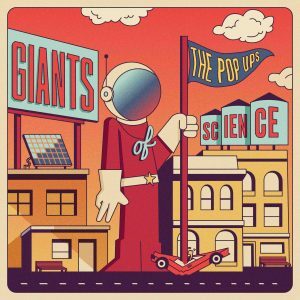 Finally, enter the world of STEM with Giants of Science by the dynamic duo The Pop Ups. On this, their fifth album, Brooklyn-based musicians Jason Rabinowitz and Jacob Stein let their songwriting and performing talents loose on ten new songs. A very high production value makes each of these tracks ready for play on the radio or TV. In fact, listeners of SiriusXM’s Kids Place Live will already be familiar with the fun, question-filled tune, “How Do We Know.” Covering everything from shadows and inventors to space and time, The Pop Ups unique style of music will keep family members of all ages engaged and asking for more. Returning with their first album in five years, the Deedle Deedle Dees created another great collection of songs that are not only fun to listen to, but also teach something along the way. The 16 original songs in this collection span a variety of musical genres while celebrating real-life heroes. These heroes include Houdini, Ada Lovelace – the world’s first computer programmer, and swimmer Diana Nyad, as well as Charles Darwin and the early human, Lucy. 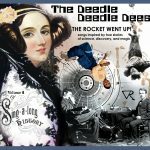 Joining in on the fun is an ode to 3.14 in “Pi,” a fun sing-a-long honoring female astronauts in “The Rocket Went Up!,” and a rap battle for the ages in “Tesla v. Edison.” The songs on this album could easily be used as conversation starters, writing prompts or an introduction to the subject matters. 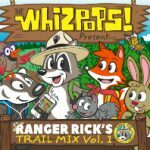 Ranger Rick’s Trail Mix Vol.1 Performed by The Whizpops! While the focus of The Deedle Deedle Dees album is real-life heroes, The Whizpops! concentrate on songs filled with facts about some of the endangered wildlife of North America. Known for their science based music, The Whizpops! put their songwriting skills to work on 11 original songs that highlight animals such as the California condor, bison, the bull trout and the polar bear. Each song tells the story of a different animal, such as “Everything’s Better with a Mustache (Walrus Song),” with clever lyrics that weave facts about the animal’s habitat, life cycle and eating habits in in a way that feels like fun exploration. Adding to the revelry are several musical genres including a Bee Gee’s vibe on “Black Footed Ferret” and the reggae sounds detailing the life cycle of the “Monarch.” While this album is chock-full of facts and doesn’t shy from using words like carrion, metamorphosis and chrysalis, it never feels the least bit didactic. This collection would be a lively, informative addition to classroom units about animals.